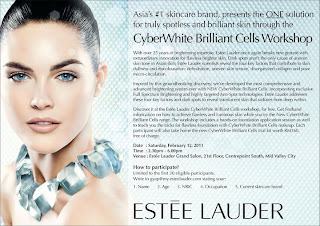 Exclusive Pre-View Workshop: Asia #1 Skincare Brand presents the ONE Solution for truly spotless and brilliant skin through CyberWhite Brilliant Cells Workshop. Exclusively for our Facebook fans, aged between 25 - 35 years. Limited to the 1st 30 respondents. Kindly email gyap@my.esteelauder.my your Name , Age, NRIC, Occupation and current skincare. Please read the e-poster for more info. More information , please check Estee Lauder's facebook here.